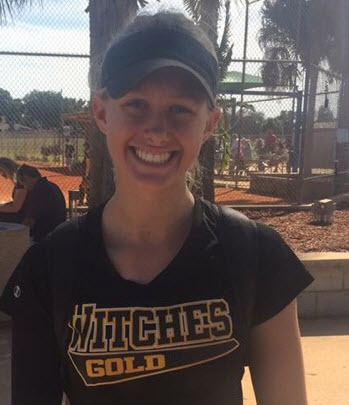 FORMER Witches Gold players share their insights and are blogging about their experiences getting a college commitment, their days at college and other information CURRENT players and families might like to hear about. 2017: September, October, A Mother's Perspective, What do you get when Witches Gold mixes with Hungarian Red? What do you get when Witches Gold mixes with Hungarian Red? An amazing experience. This season three players, Csenge Csiszar, Nora Antal, and Zoe Flachner, from the Hungarian Reds Softball team joined the Witches Gold team to experience softball in the States. Here’s what they have to say about Softball in the US, playing with the Witches and what’s on the horizon. Csenge, Nora and Zoe were given the unique opportunity to play softball, a game that they are all passionate about, in a different country. They were afforded this opportunity by Shawn Allen, one of the founders of the Witches program. Shawn was contacted by Tori Sovak, a former Witch and current head coach for the Hungarian team. Tori knew that Shawn would offer guidance and key skills her players needed to learn more about the sport and to participate in a higher level of play. “Their time in the US and playing with the Witches has been enjoyable. The experienced gained has been second to none,” stated Lou Sovak, Tori’s dad. “I am so proud of the Ninjas/Witches organization, they opened their hearts and gloves to these players and welcomed them aboard as family!” said Shawn Allen. Lou went on to explain that one of the biggest differences between softball in the US and Hungary is the level of play. The pitching is much faster with multiple placement points. There are also many more teams in the US with more opportunity to play. Unlike the US, softball—and sports in general—is not offered at University in Hungary. The girls need to look at recreational programs in their country. However, experiencing softball in the US has created a desire for wanting to continue to play and they are considering ways in which they can attend University in the States. The venture with the Witches may even create more opportunity for the Hungarian team. “The trip to the US may attract more girls to try softball. 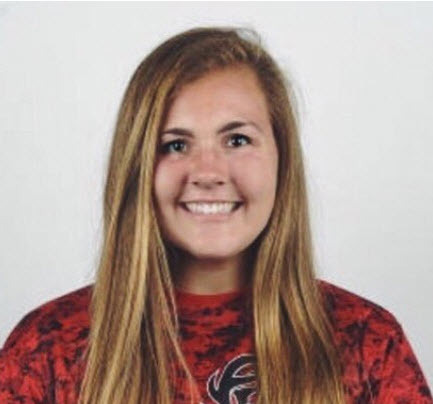 At the very least the younger girls within the Reds organization view this as an opportunity to potentially be selected to come to the states to play with organizations like the Ninjas/Witches” stated Tori, who also played professionally in Europe. In addition to softball, the girls have acclimated well to a western lifestyle, attending Trenton Thunder games, trips to the beach and Great Adventure as well as exploring our fast food culture. Favorites include Chick-fil-A and Dairy Queen! The girls are in town until July 12 and will be filling in as needed. If you see them on the fields, cheer them on!! When Grace was 8 years old someone told me that I should take her to a pitching coach- to be honest I didn’t even know that was a thing. I got the phone number for two local coaches but for some reason my mind stuck with the one. I left him a message that day that I had a little Jenny Finch for him, even though she is a righty and my kid was a lefty. At the time I had no idea that there was even a difference when it came to chucking a softball and boy oh boy I can’t tell you how many times that pitching coach and I laugh about that first message now. You see that little lefty has turned herself into one of the premier pitchers in the country and will be playing for SEC powerhouse Mississippi State this time next year. The journey has been an absolute roller coaster ride of athletic and emotional ups and downs, constant decision making, non stop hard work, dedication and loyalty as well as forming and maintaining relationships that have changed our lives forever and will last a lifetime. When Grace turned 12 yrs old she attended a Villanova Summer Softball Camp where she caught everyone’s attention especially that of Hillary Allen, she told me Grace should come play for her father Shawn, little did I know that that was a super elite 18U Gold Team. Grace pitched for him a month later and she has been a Witch ever since. The coaches and girls on that team welcomed her with open minds and open arms and she found her home. The rest they say is history. I said history, not easy. The journey has never been easy. You see I have four other children who as we were making our way into the softball world, were playing college basketball and high school sports and modeling and doing a million other things while I was busy coaching at the high school as well. Over lots of crock pot dinners the kids never missed a practice or game and Grace and I never ever missed a pitching lesson- I am still her catcher. Things have slowed down as my kids have become young adults- one a teacher, one a social worker, one a junior in college and Grace and her twin getting ready to graduate high school. As I reflect back I cannot believe how fast the time went. I can’t stop thinking about being super blessed. I played Division I college basketball and that round orange ball afforded me a free education and an MBA and basically formulated my life -until I met the 12” softball. That ball and that sport has been life changing. The opportunities that ball have given us are just too many to mention. The relationships and the people we have met along the way have been astounding. The lessons we have learned, the decisions we have made , good and bad are now lifelong tools. The hard work, dedication, and loyalty put in is immeasurable. The journey in New Jersey is now winding down- but its not an ending, it's a new beginning . All of us who have worked so hard along Grace’s side now get to become SuperFans of Mississippi State! We are forever grateful for the 12” softball and everything it stands for-we wouldn't have ever changed a thing. My freshman year here at Fairfield flew by --AND what a roller coaster ride it was. I've dealt with all the typical freshman struggles of homesickness, trying to time manage, getting in my study hall hours, doing the team’s laundry, adapting to sharing a dorm room with a girl I’d never met before and in the midst of it all just trying to find some me time. But when you get to travel all over playing the game you love and alongside the twenty new best friends you make, all of the long days and nights are 100% worth it in the end. Last year my team played up in the northeast for all of our conference games but we made our way down to North Carolina, Virginia and Florida for preseason and Louisiana for the post season. We went from thinking we weren’t even going to make our conference tournament to being the sixth seed that went undefeated and earned ourselves a bid in the NCAA tournament!! Being a part of a NCAA selection show is just as cool as it sounds. Then getting picked to compete at LSU in the Baton Rouge Regional against some of the best softball players in the game was an actual dream come true. I can only hope every softball player gets to experience that one day. I know that I am still in shock and disbelief over it all and it has been months. That night was definitely the highlight of my softball career, May 15th, 2017. Or wass May 19th, 2017 when I got to bat against Carley Hoover? It’s a toss-up! Now in my sophmore year and I couldn’t be more excited. Coming back this year was so much different than last year because I knew exactly what to expect. I knew how practices would run, what classes I should take and where they were, I now get to live alongside my best friend and most importantly no more laundry duty!! Freshman year was very good to me, but I know that sophomore year has potential to be even better. I just declared as a Marketing major here at Fairfield and I am looking to minor in Sports Leadership and Management. My end goal is to get a job in the sports marketing field and hopefully with one of the big shot corporations like ESPN, NBC Sports, NFL Network, etc. Gotta dream big!! There are so many people regardless of what university you attend that have great advice and connections that can help you get to where you want to be. I was lucky enough to do an internship this summer with the MAAC (Metro Atlantic Athletic Conference) which is the conference I play in! I met so many great people and learned so much. You are on you own at college so you have to make the most of every opportunity and remember that softball doesn’t last forever, so make sure you seriously consider that in your college choice. Do what you have to do to get yourself out there starting day one, they aren’t lying when they say it will be the fastest 4 years of your life!! Let me start by saying I am very excited to be at St. Johns University. The semester has just started and I'm currently taking 5 classes—basically an average load for an undecided major. My class load includes research requirements, plenty of reading (history 29 pages + notes for possible pop quiz, English 40 pages + notes for class discussion and pop quiz, psychology 36 pages + notes), speeches for my public speaking class (and other classes) and exams are already on the calendar and coming up. I have 6 hours of study hall to fulfill. I also have community service requirements. All is going well so far but there is a lot of adjusting--namely to the team and being without parents, finding time to eat shower and sleep, getting alone or down time and simply being a normal student. THIS IS NOT HIGH SCHOOL...very little slacking off and very little down time. A commitment to atlethics in college, especially at a Division I school, is at the highest level. Netflix, not happening. Staying out with friends, no way. Don’t get me wrong. There is not a chance I would change my decision. I love what I am doing. And I love softball. But I share this with you because if you are considering the possibility of playing ball in college you REALLY NEED TO LOVE THIS GAME. You will have two jobs: one as a full-time student and the second as a full-time athlete. Both of these commitments are critical to your success. In no way am I trying to scare you. I am trying to let you know what its like and to consider your next move carefully. You need to love softball, hard work and the challenge of juggling a lot. I know you can do…and I know I can do it. Best of luck, I love you all and can't wait to see you in the winter!